is a ransomware program that was released around the beginning of September 2013 that targets all versions of Windows including Windows XP, Windows Vista, Windows 7, and Windows 8. 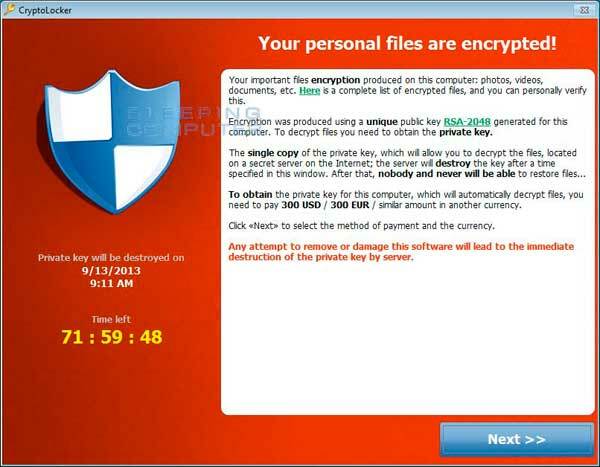 This ransomware will encrypt certain files using a mixture of RSA & AES encryption. When it has finished encrypting your files, it will display a CryptoLocker payment program that prompts you to send a ransom of either $100 or $300 in order to decrypt the files. This screen will also display a timer stating that you have 96 hours, or 4 days, to pay the ransom or it will delete your encryption key and you will not have any way to decrypt your files. This ransom must be paid using MoneyPak vouchers or Bitcoins. Once you send the payment and it is verified, the program will decrypt the files that it encrypted. The bad news is decryption is impossible unless a user has the private key stored on the cybercriminals’ server. Currently, infected users are instructed to pay $300 USD to receive this private key. Infected users also have a time limit to send the payment. If this time elapses, the private key is destroyed, and your files may be lost forever. In some cases, it may be possible to recover previous versions of the encrypted files using System Restore or other recovery software used to obtain “shadow copies” of files. Unfortunately at this time there is no way to retrieve the private key that can be used to decrypt your files without paying the ransom. Brute forcing the decryption key is not realistic due to the length of time required to break the key. Also any decryption tools that have been released by various companies will not work with this infection. The only method you have of restoring your files is from a backup or Shadow Volume Copies if you have System Restore enabled. Newer variants of CryptoLocker attempt to delete the Shadow Copies, but it is not always successful. FoolishIT LLC was kind enough to create a free utility called CryptoPrevent that automatically adds the suggested Software Restriction Policy Path Rules listed below to your computer. This makes it very easy for anyone using Windows XP SP 2 and above to quickly add the Software Restriction Policies to your computer in order to prevent CryptoLocker and Zbot from being executed in the first place..
Once you run the program, simply click on the Block button to add the Software Restriction Policies to your computer. If CryptoPrevent causes issues running legitimate applications, then please see this section on how to enable specific applications. Suite provides a powerful on-access scanner component designed to monitor the system in real time. Keeping the operating system and associated software properly updated can also be crucial in maintaining a malware-free environment. Although removal of Cryptolocker is included with a Stop Sign subscription, concern the user may not have a backup of their documents has prompted the Stop-Sign Research and Development Team to decide to not incorporate an automated removal of Cryptolocker into the scanner. 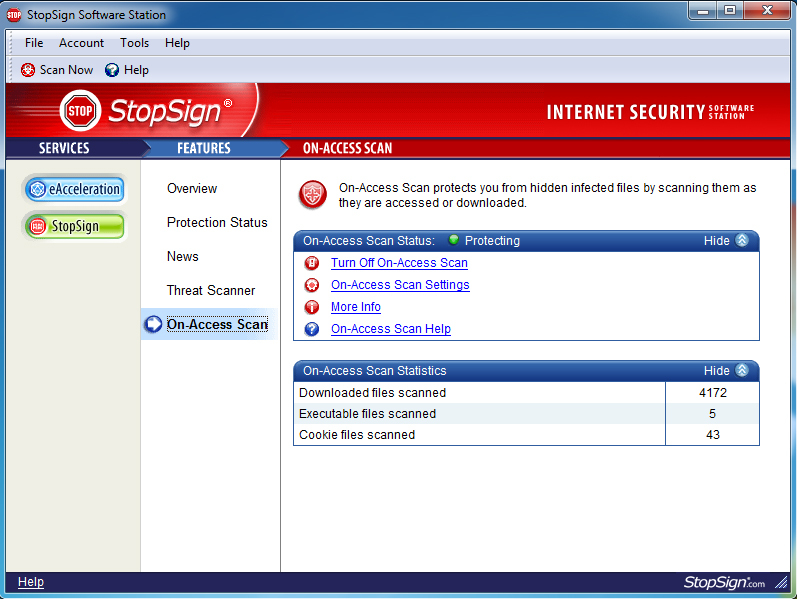 Anti-Malware can detect and remove this ramsomware malware. Malwarebytes detects Cryptolocker infections as Trojan.Ransom, but it cannot recover your encrypted files due to the nature of asymmetric encryption, which requires a private key to decrypt files encrypted with the public key. 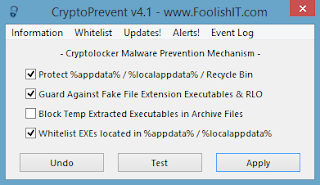 by Bit Defender an Encryption blocking tool that can detect and block malware from the installation . Intrusion prevention Systems can block the communication protocol send from the Cryptolocker infected ssytem to the remote command-and-Control server , where the malware retrieves the key to encrypt the files. is a universal solution against crypto ransomware. This type of ransomware encrypts your personal files and demands a ransom fee to be paid in order to regain access to your files. HitmanPro's CryptoGuard monitors your file system for suspicious operations. When suspicious behavior is detected, the malicious code is neutralized and your files remain safe from harm. CryptoGuard works silently in the background at the file system level, keeping track of processes modifying your personal files. CryptoGuard works autonomously, so no user interaction is required.